I simply adored this story for many of the reasons you mentioned, especially the flow of the writing. Reminds me I need to read this one again. Thanks for the review. I love your choices. Animal lovers will surely be drawn to the cover. This sound like a great adventure, both internally and externally. Excellent review! This sounds like a marvelous adventure! 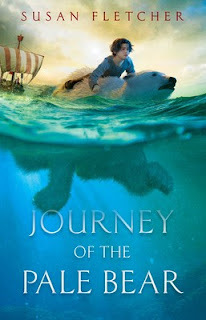 Polar bears and pirates - a "Must read" combo. Thanks for your thoughtful comments to entice me into reading it. I have been hearing about this book and already have it on my TBR list. Thanks for the reminder and a good review. I remember that Greg really liked this too. Sounds like a great choice for kids who love animals and adventure. I hadn't heard of this--but it sounds fantastic. Thank you for the snippets of the writing; it is lyrical and powerful. I think the cover is brilliant, too. Thanks for sharing this one with us, Andrea. I do love animal stories, and I think this cover is just beautiful.